The Delhi Chief Minister was at a meeting at (NCP) leader Sharad Pawar's home which also featured Mamata Banerjee and Rahul Gandhi. Lok Sabha polls: Arvind Kejriwal said his party was more keen on alliance with Congress. Arvind Kejriwal said today the Congress has "nearly said no" to an alliance with his Aam Aadmi Party (AAP) in Delhi, a day after an late-night opposition meeting he attended along with Congress president Rahul Gandhi. "We are very worried about the nation, so we are more keen (on an alliance). The Congress has almost said no to an alliance," Arvind Kejriwal said, asked by told reporters today. 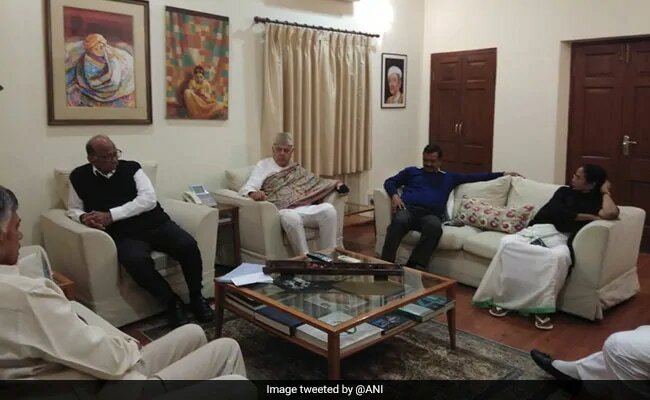 The Delhi Chief Minister was at a meeting at Nationalist Congress Party (NCP) leader Sharad Pawar's home to prepare a united strategy for the national election due by May, which also featured Bengal Chief Minister Mamata Banerjee and Rahul Gandhi. The Congress president's comment after the meeting had indicated that his party was ready to go it alone in both Bengal and Delhi, where his party is a rival to Mamata Banerjee's Trinamool Congress and Arvind Kejriwal's AAP. "We will compete with each other as well," said Rahul Gandhi. Arvind Kejriwal was at a meeting at Sharad Pawar's home to prepare a united strategy for the national election, which also featured Rahul Gandhi. Mamata Banerjee announced that the opposition parties had decided on a pre-poll alliance to take on Prime Minister Narendra Modi and the ruling BJP. Asked about Bengal and Delhi, she said it has "not been decided yet". But sources said opposition leaders urged Mr Kejriwal and Rahul Gandhi to consider burying their differences for the national election. The lack of an alliance in Delhi could harm the picture of unity, the two were told. The BJP won all seven parliamentary seats in Delhi in the 2014 national election. Since then, it is AAP that has won more in the capital. The party swept the 2015 Delhi election in which the Congress scored a duck. Ties between the Congress and AAP have never been easy. AAP was born out of the anti-corruption movement of Anna Hazare and Arvind Kejriwal, which became a big headache for the Congress-led central government. In 2013, the Congress helped AAP take power in Delhi, but Mr Kejriwal quit after a 49-day stint over the anti-corruption Lokpal bill. Two years later, AAP returned to power with a spectacular mandate and the Congress was wiped out. Ajay Maken, as the Congress's Delhi chief for four years, was firmly opposed to any alliance with AAP, believing that it would weaken Congress further. After Mr Maken's resignation in January, there was speculation that the Congress was inclined towards a tie-up with AAP but former chief minister Sheila Dikshit, who was appointed Delhi chief, ruled it out. Congress leaders do not assess any gain from a tie-up with AAP. Yet, both parties are aware that the anti-BJP vote will be divided without an alliance and only the BJP can win in a triangular contest.